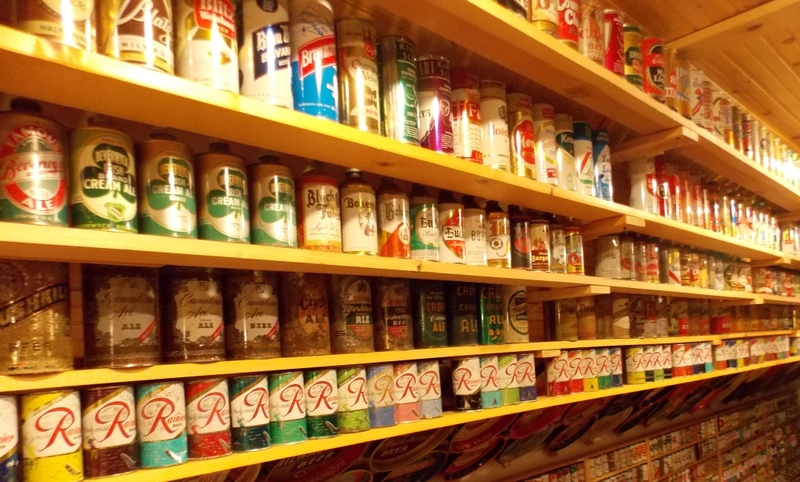 A handful of longtime beer can collectors have compiled this site to provide a history of beer cans and the beer can collecting hobby. Only one of the biggest finds in Beer Can History!!! A: These cans were discovered during the demolition of a Supersonic Wind Tunnel. This fall my collector friends and I were fortunate enough to acquire several boxes and bags of cans from the big find in the Northwest. Q: Why would cans be in a Wind Tunnel? Did the workers like to tip back a few? A: Amazingly enough empty cans proved to be a necessary component of the wind tunnels that were used to test rockets, missiles, and the newest supersonic aircraft. Empty cans absorbed and released heat, to ensure wind tunnel tests were not ruined by condensation. Q: Were the spheres filled with just beer cans? A: Nope. Mostly the cans were plain silver cans that would normally have received a paper label had they ever been filled. Q: What painted cans were found? A: Aside from beer cans, there were lots of Soda cans including 10oz Shasta, Nehi, Royal Crown, and even Coke or Pepsi. 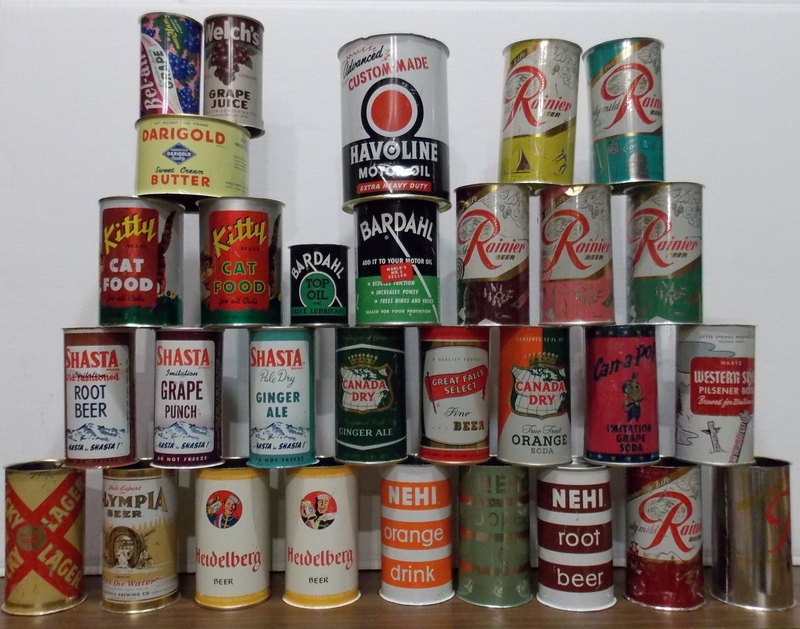 There were also motor oil (Bardahl) cans, grape juice cans(Welches), cat food cans (Kitty Cat), and even some butter, salmon, and dungeness crab cans. Q:What beer cans were found? 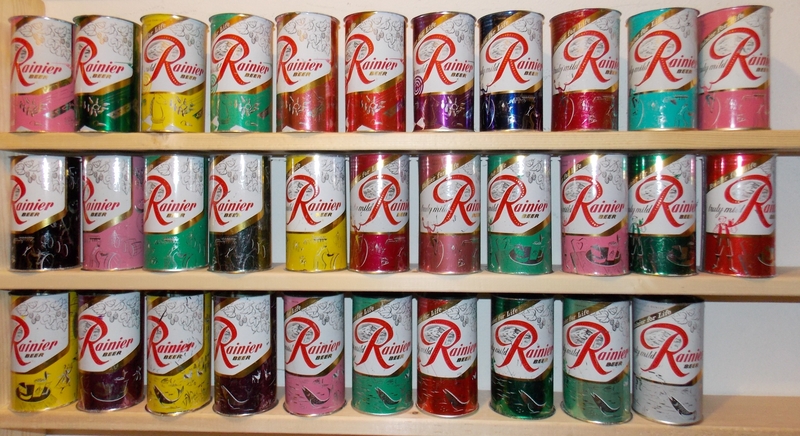 A: They were all northwest brands the vast majority of which are: Rainier Jubilee cans, Rainier Ale, Olympia, Heidelberg, Lucky. There were very few Rainier "block letter" ales, Great Falls, Hartz Western Style, and Sicks Select. 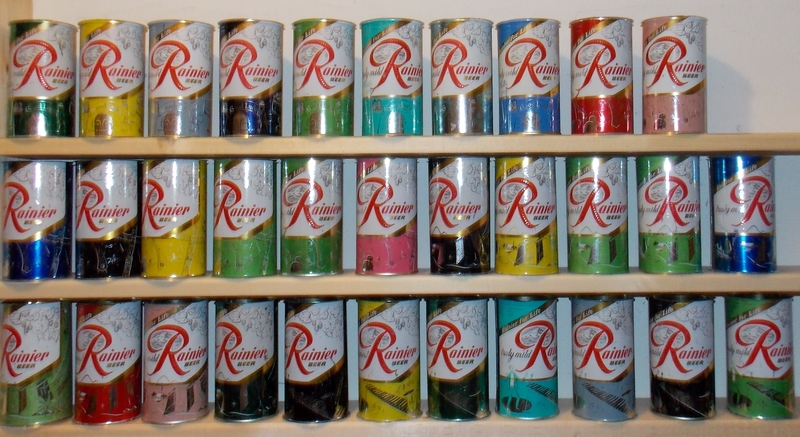 if one had to pick any brand of beer from the 1950s, with the greatest variety of cans, it would be the Rainier. This find alone had a dozen different series of cans, with over 15 different colors, from breweries both in Seattle and Spokane. Condition is great since the cans were sealed for 60 years. There is almost zero rust, but there are scratches from the cans being shaken during the tests. Q: How many were found? A: We were fortunate to get over 2000 cans in this group. 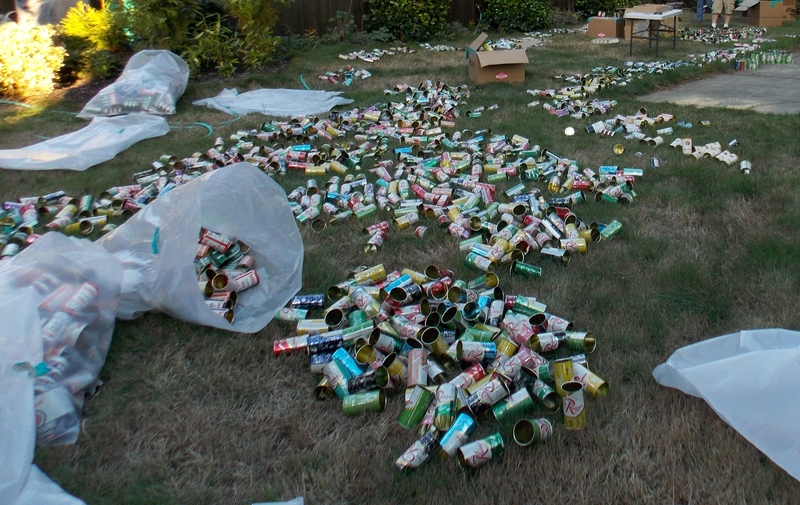 This picture below shows my back yard where we sorted the cans. 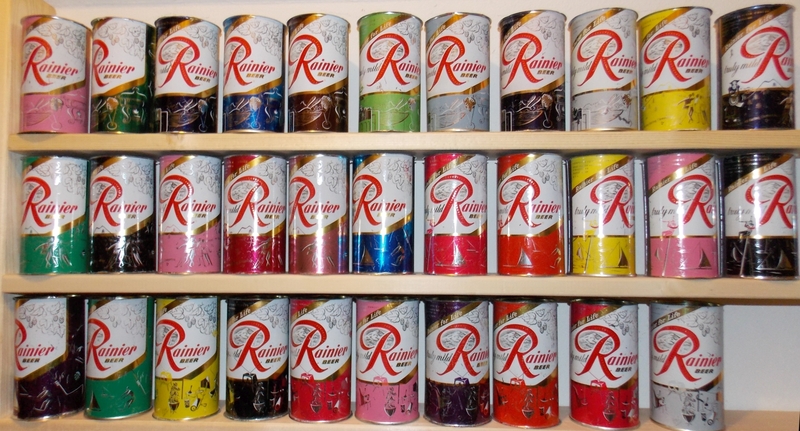 I was able to get 150 different Rainier Jubilees for my collection. Some of those are shown above. Q: What about the extras? We are selling some of the those on our Beer Cans for Sale page. Prices start at $15 for the poorest condition, and most common cans. There are still many other pages on the BeerCans.org website. Click on one of the cans at left to visit the beer can categories. Our biggest project ever is coming. The Encyclopedia of Beer Cans is under construction. Our goal is to picture several thousand different beercans on state by state. Check out the first states Arizona , California , Colorado , Connecticut . As of November, 2008 they are mostly complete. Since so many people write to ask what a can or collection is worth, we have begun building a page to describe Beer Can Values. 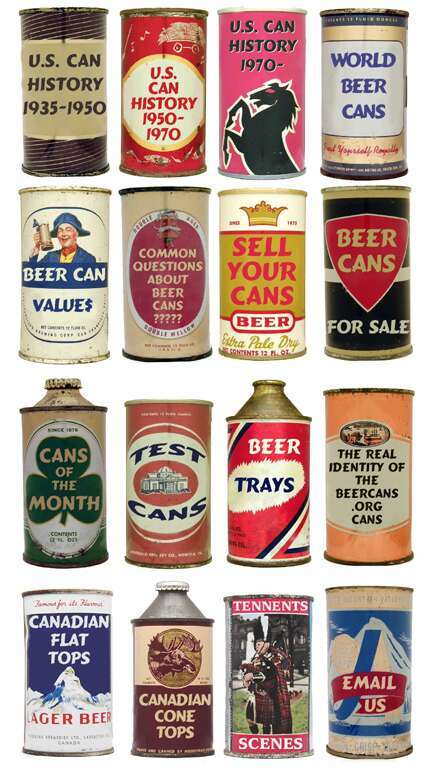 While we can't describe every can, we do describe cans from several different time period. For each group we describe a typical price range and a price range for the more exceptional cans. We are in the process of compiling a complete list of all Canadian Flats and Cones. We need your help to complete the entire list. If you are a member of the BCCA, you probably saw the list in the February, 2001 news report. The larger photos here on the website will hopefully make it easier to spot any variations. To go to any of the individual beercans.org pages, click on the appropriate can above.